Joice "Teurai-Ropa" Mujuru (born Runaida Mugari; 15 April 1955) is a Zimbabwean politician who served as Vice-President of Zimbabwe from 2004 to 2014. Previously she had served as a government minister. She also served as Vice-President of ZANU-PF. She was married to Solomon Mujuru until his death in 2011 and was long considered a potential successor to President Robert Mugabe, but in 2014 she was denounced for allegedly plotting against Mugabe. As a result of the accusations against her, Mujuru lost both her post as Vice-President and her position in the party leadership. She was expelled from the party a few months later, after which she formed the new Zimbabwe People First party. The Vice-President of Zimbabwe is the second highest political position obtainable in Zimbabwe. Currently there is a provision for two Vice-Presidents, who are appointed by the President of Zimbabwe. The Vice-Presidents are designated as "First" and "Second" in the Constitution of Zimbabwe; the designation reflects their position in the presidential order of succession. Solomon Mujuru, also known by his nom-de-guerre, Rex Nhongo, was a Zimbabwean military officer and politician who led Robert Mugabe's guerrilla forces during the Rhodesian Bush War. He was from the Zezuru clan. In post-independence Zimbabwe, he went on to become army chief before leaving government service in 1995. After leaving his post in the Zimbabwe National Army, he got into politics becoming Member of Parliament for Chikomba on a Zanu PF ticket. He was generally regarded as one of the most feared men in Zimbabwe. His wife, Joice Mujuru, became Vice-President of Zimbabwe in 2004. Zimbabwe "illegal gold sale bid"
Mujuru was born in Zimbabwe's Northeastern district of Mt. Darwin, a Shona from the Korekore language group . As a Shona (a conglomeration of various tribes with a common sounding Bantu language) she is of the same language group as Vice-President Joseph Msika and President Robert Mugabe as well as political rivals Morgan Tsvangirai and Emmerson Mnangagwa. However, they come from different dialect groups with Mugabe being Zezuru and Mnangagwa being Karanga. Tsvangirai is a Manyika from Buhera District in Manicaland. Mount Darwin is a town in Mashonaland Central province in Zimbabwe. Joseph Wilfred Msika was a Zimbabwean politician who served as Second Vice President of Zimbabwe from 1999 to 2009. Christopher Hatikure Mutsvangwa is a Zimbabwean politician, diplomat and businessman. A veteran of the Rhodesian Bush War, Mutsvangwa served the government of independent Zimbabwe and the ZANU-PF party in a number of roles, including as Director-General of the Zimbabwe Broadcasting Corporation, Ambassador to China, head of the Zimbabwe National Liberation War Veterans Association, and Veterans' Welfare Minister. Upon return from the war, little was known of the origins of her name and her real name. Her mother, in an interview for The Sunday Mail newspaper at her rural Mount Darwin home, spoke exclusively to journalist and media anthropologist Robert Mukondiwa, to whom she revealed that Joice was a name she had also adopted during her time away at the war. Her actual name, he was told, was Runaida, which had been her late paternal aunt's name. Alamein Farm, also known as Ruzambu Farm, is a 5,000 hectare farm at Beatrice, in the Mashonaland East area of Zimbabwe, 72 km south of the capital Harare. It was a highly productive commercial farming operation, employing around one thousand people and producing large quantities of tobacco, maize and Rhodes grass, as well as cattle and farmed game. The farm gained notoriety in 2002, when General Solomon Mujuru and his wife, Zimbabwean Vice President Joice Mujuru, evicted the farm owner and all farm inhabitants under the auspices of the Land Reform Programme, and became the first of President Robert Mugabe's inner circle to be found guilty of unlawful land seizures. Under General Mujuru, the farm continued to produce tobacco, maize and game. Farm workers also produced their own tobacco on land allocated to them. At independence in 1980, Mujuru became the youngest cabinet minister in the cabinet, taking the portfolio of sports, youth and recreation. She fitted secondary school in between her busy schedule after she was appointed minister. As Minister of Telecommunications, she tried to stop Strive Masiyiwa from establishing his independent cellphone network Econet. Masiyiwa had been given an ultimatum by the cabinet to sell his imported equipment to his rivals. On 24 March 1997, Mujuru decided to issue Zimbabwe's second cellular telephone licence to the previously unknown Zairois consortium Telecel,  cutting out Masiyiwa. The Zairois consortium included her husband Solomon and President Robert Mugabe's nephew Leo. After many legal fights, Masiyiwa won his licence in December 1997. Strive Masiyiwa is a London-based Zimbabwean businessman, entrepreneur, and philanthropist. He is the founder and executive chairman of diversified international Telecommunications, Media and Technology group Econet Wireless. The ZANU-PF Women's League resolved at its annual conference held in September 2004 to put forward a female candidate for the party's vice-presidency, a position left vacant following the death of Simon Muzenda. She currently lives on Alamein Farm, a productive and high-value operation illegally requisitioned as part of the land reform programme from Guy Watson-Smith in 2001,  as found by the Zimbabwe High Court and international courts. In 2001 the Mujuru family became the subject of the first legal action against any member of Mr Mugabe's inner circle implicated in the illegal seizure of land and assets. Emmerson Dambudzo Mnangagwa is a Zimbabwean revolutionary and politician who serves as the third and current President of Zimbabwe since 24 November 2017. A member of ZANU–PF and a longtime ally of former President Robert Mugabe, he held a series of Cabinet portfolios and was First Vice-President of Zimbabwe under Mugabe until November 2017, when he was dismissed before coming to power in a coup d'état. He was officially inaugurated as the third President of Zimbabwe on 26 August 2018 after narrowly winning the 2018 Zimbabwean general election. Sydney Tigere Sekeramayi is a Zimbabwean politician who served in the government of Zimbabwe as Minister of Defence between 2013 and 2017. He has been a minister in the Cabinet since independence in 1980, serving as Minister of Defence from 2001 to 2009 and Minister of State Security from 2009 to 2013. Patrick Antony Chinamasa is a Zimbabwean politician who served in the government of Zimbabwe as Minister of Finance and Economic Planning. He briefly served as Minister of Cyber Security, Threat Detection and Mitigation from October 2017 to November 2017. He made headlines across Zimbabwe in June 2018 after officially opening a rubbish metal bin fully strapped with ribbons. A move seen by many people as ridiculous.. Previously he served as Minister of Finance and Minister of Justice, Legal and Parliamentary Affairs. Oppah Muchinguri Kashiri is a Zimbabwean politician, who is the current Minister of Defence in the Cabinet of Zimbabwe. She has also served as Minister of Higher Education and Minister of Women's Affairs. Muchinguri ran as the ZANU-PF candidate for Mutasa Central constituency in the March 2008 parliamentary election, but was defeated by Trevor Saruwaka, a candidate of the Movement for Democratic Change – Tsvangirai. According to official results, Muchinguri received 4,764 votes against 9,228 votes for Saruwaka. Simbarashe Herbert Stanley Makoni is a Zimbabwean politician and was a candidate for the March 2008 presidential election against incumbent Robert Mugabe. He was Minister of Finance and Economic Development in President Robert Mugabe's cabinet from 2000 to 2002. He faced strong opposition during the Economic Change in Zimbabwe in the early 2000s as his policies contradicted those of the rest of the ZANU-PF party. Kembo Dugish Campbell Mohadi is one of two Vice-Presidents of Zimbabwe since 28 December 2017. He briefly served as the Minister of Defence, Security and War Veterans in 2017. Previously he was Minister of State for National Security in the President's Office from 2015 to 2017 and Minister of Home Affairs from 2002 to 2015. Webster Kotiwani Shamu is a Zimbabwean politician and former Minister of Mashonaland West Provincial Affairs fired by President Emmerson Mnangagwa on 21 May 2018. He previously served as Minister of Information and Publicity, and Minister of State for Policy Implementation. He is a member of parliament representing the Chegutu constituency. The Cabinet of Zimbabwe was later dissolved on 27 November 2017. Munacho T.A. Mutezo is a Zimbabwean engineer, businessman and politician. He was born on 14 February 1954 in Chimanimani, Zimbabwe. Grace Ntombizodwa Mugabe is the second wife of former Zimbabwean President Robert Mugabe. She served as the First Lady of Zimbabwe from 1996 until her husband's resignation in November 2017, a week after he was ousted from power. Starting as a secretary to President Mugabe, she rose in the ranks of the ruling ZANU–PF party to become the head of its Women's League and a key figure in the Generation 40 faction. At the same time, she gained a reputation for privilege and extravagance during a period of economic turmoil in the country. She was expelled from the party, with other G40 members, during the 2017 Zimbabwean coup d'état. The 9th Parliament of Zimbabwe was a meeting of the Zimbabwean Parliament, composed of the Senate and the House of Assembly. It met in Harare over five sessions from 25 August 2008 to 27 June 2013. Its membership was set by the disputed 2008 Zimbabwean general election, which resulted in a ZANU–PF majority in the Senate and Movement for Democratic Change – Tsvangirai control of the House of Assembly. Political negotiations resulted in the 2009 Government of National Unity, a coalition government composed of ZANU–PF, the MDC–T, and the MDC–M. Constantino Guveya Dominic Nyikadzino Chiwenga is a retired Zimbabwean general currently serving as Vice-President of Zimbabwe since December 2017. He has served as the Vice-President of the ruling ZANU-PF party since December 2017. He also served as the Minister of Defence, Security and War Veterans between December 2017 and September 2018, He is the former Commander of the Zimbabwe Defence Forces and Commander of the Zimbabwe National Army. A general election was held on 30 July 2018 in Zimbabwe to elect the President and members of both houses of Parliament. Held eight months after the 2017 coup d'état, the election was the first since independence in which former President Robert Mugabe was not a candidate. Beauty Lily Zhuwao is a Zimbabwean politician, and the wife of government minister Patrick Zhuwao. She is also the daughter-in-law of Sabina Mugabe, the sister of former President of Zimbabwe Robert Mugabe. Prior to 2015, Zhuwao was active in ZANU–PF politics, serving for several years as the party's provincial treasurer for Mashonaland West Province. The following lists events from the year 2018 in Zimbabwe. 1 2 3 4 5 Pennington, Reina. Amazons to Fighter Pilots: a Biographical Dictionary of Military Women. Westport: Greenwood Press. p. 316. ISBN 0313327076. ↑ "VP Mujuru stole my picture: War veteran". The Herald. 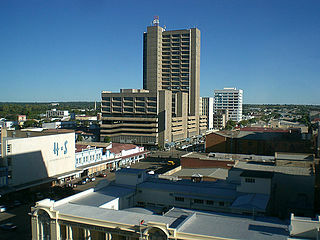 Harare, Zimbabwe. Retrieved 9 February 2016. ↑ "Nhongo (née Mugari), Joyce (1955–)". The International Dictionary of Women's Biography. New York: Continuum. 1985. p. 342. ISBN 0-8264-0192-9. ↑ "Profile: The Mujuru couple". BBC. 24 February 2009. Retrieved 24 May 2013. ↑ "Zim government leaves out cellphone pioneer". ZA*NOW (Electronic Mail and Guardian). South Africa. 24 March 1997. Archived from the original on 14 April 2005. ↑ "Mugabe moves against party rivals". BBC. 1 December 2004. Retrieved 24 May 2013. ↑ "ZIMBABWE: Mujuru sworn in as vice president", IRIN, 6 December 2004. ↑ "Zimbabwe: Zanu-PF Names Poll Candidates". The Herald . 15 February 2008. Archived from the original on 19 February 2008. ↑ Mutongi Gava, "VP Mujuru not defeated", newzimbabwe.com, 31 March 2008. ↑ "Zimbabwe President Mugabe swears in vice presidents", Xinhua, 14 October 2008. ↑ "Farm owner given minutes to leave his Farm" Archived 5 August 2011 at the Wayback Machine ., London Evening Standard, 10 February 2003. ↑ " Evicted farmer sues for return of £2m assets", The Telegraph, 24 December 2001. ↑ "Britain must act on Zimbabwe", London Evening Standard, 25 January 2002. ↑ "Zimbabwe: Waiting for the Future", International Crisis Group, 29 September 2014. Retrieved 9 October 2014. ↑ MacDonald Dzirutwe, "Zimbabwe's Mugabe fires deputy, seven ministers", Reuters, 9 December 2014. ↑ "Zimbabwe ruling party expels Mugabe rival Joyce Mujuru". BBC. 3 April 2015. ↑ AFP. "Mujuru expelled from Zanu PF". ↑ "Robert Mugabe's new opponent: his 'daughter' Joice Mujuru", The Telegraph. ↑ "Mujuru change her faction's party name to National People's Party", The Herald. ↑ Nqbani Ndlovu and Sharon Sibindi, "Mujuru, Biti, Dabengwa form own coalition", Newsday, 23 September 2017. ↑ "Zimbabwe 'illegal gold sale bid'". BBC. 25 February 2009. Retrieved 28 February 2009. Wikimedia Commons has media related to Joice Mujuru .